So, that technology thing again. I taught a lesson today, during which I used a cassette player. I also couldn’t switch the computer on as I needed the socket for the cassette recorder. So no interactive whiteboard either. It was a fairly organic board (yes, I know that’s a posh way of saying “unplanned”), but it captured everything from the lesson where an IWB would have sprawled across multiple pages. The list in the middle is the answers to the listening task (listen and say what type of relationship it was). 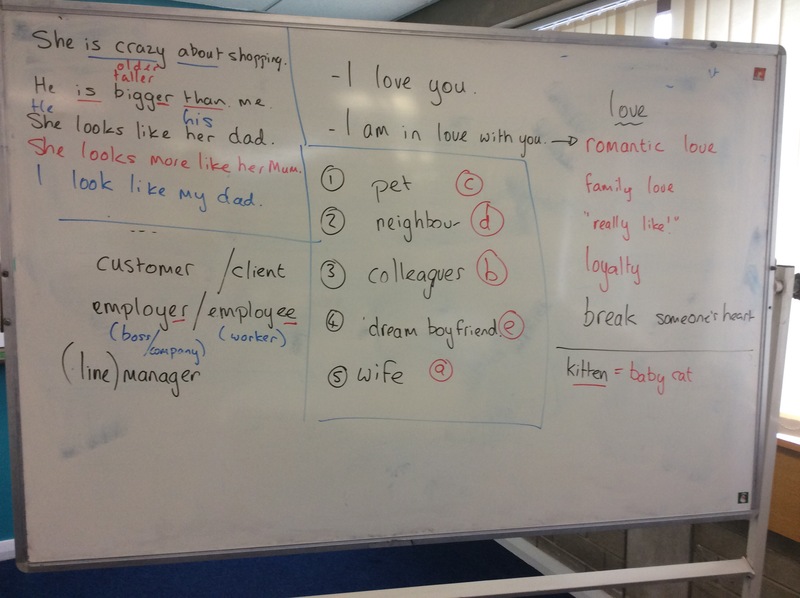 The words in the top right and bottom left are the remnants of a discussion that we had at the beginning about different types of relationships (it was tempting to drill “I am in love with you” but propriety stopped me). The stuff at the top left is language that emerged during the final speaking task (tell your partner about three different relationships). It’s not an award-winningly clear whiteboard, and it only made sense if you were there, but it captured it in one “screen”. And I do think this is a valuable skill. I worry with CELTA trainees, in a curmudgeonly kind of way, that they are all learning how to use an interactive whiteboard and PowerPoint before they have really learned how to use a whiteboard. I worry about this because there is a very real chance they may rock up at a job in a year or so and find themselves with nothing more than a few old coursebooks and a whiteboard and pens, and not know what to do with it. Or cassettes: standing there with the original Headway and some old cassettes, how will they cope? Ok, so that’s maybe a little OTT, but you know, I wonder. Then there also the sneaky, naughty, not-Best Practice thought that although things like IWBs and digital recordings bring a load of convenience to the classroom (and believe me, I’d miss them) another part of me wonders if there’s something to be said for the discipline of a whiteboard and a cassette player which makes you think more concisely about what language is happening in the classroom. Or perhaps it’s just me, and perhaps I can think of ways of bringing across that focus and concision into using an interactive whiteboard, so that all the other bonuses of the interactive whiteboard (printability, quick access to google images, that sort of thing) can be utilised as well. I realise, of course, that this is a well worn tread for this blog, and I should probably redress the balance and say something warm and cosy about how great technology is. Because it is and it can be, and to be fair, interactive whiteboards are, in and of themselves, pretty remarkable bits of technology, even if they tend to be overloaded with unintuitive, gimmick-heavy software. And a digitally controlled audio recording is damn useful. But there are plenty of blogs and articles out there doing the hard sell, so I’ll leave that job for now. So for now, just remember, using tech is fine, in its place, and so is not using tech. Just don’t be too much in awe of it. Tapes are also good because you can rewind to the exact bit you need. Digital often means you have to listen to the entire text again, losing the students in the process. That was true of CDs, although played through a computer and it is probably as good as a cassette: instead of a counter you can just note the time of the bit you want to focus on. But pedagogically, I’d also say that on that count the digital element doesn’t bring anything to the party. This first really hit me when a trainee on a post experience ESOL Dip course asked for some tips on using the whiteboard..I assumed they meant the IWB, but they didn’t. They’d never not used an IWB, and, as you describe, felt a bit lost now they were teaching in a setting without one. The messages that I received from your post tells that we can do our teaching job in a fine manner without tech. What’s more, prior to tech -implementation in our context, it is better if we know how to use traditional tools, for instance whiteboards. The arguments in your ideas prompted me to write a few things in response. Let me start with the last point first. I wouldn’t support the idea that being able to use the whiteboard is a valuable skill we need to hone. Undeniably, whiteboards have many benefits. But harnessing those benefits, in my understanding, really depends on teachers’ creativity and their skills of teaching. In short, if you’re creative and have good teaching skills, you can employ any traditional tool in an effective manner. Secondly, according to SAMR tech-integration model, the technology-integration examples mentioned in the post (use of interactive whiteboards) represent low levels of technology use. In other words, in your examples, technology simply substitute traditional tools in the learning activity. However, if we want Web 2.0 tools to transform learning, we need to move up along the higher levels of tech-integration explained in SAMR. What I mean is if we want to transform learning with technology, we need to design our instructions in ways that can be transformed. However, this again really depends on teachers’ creativity and good skills of teaching plus with a bit required knowledge of technology. I do agree with you if technology simply substitutes a traditional tool in the learning activity, I wouldn’t make attempts to use it. However, if Web 2.0 tools can empower us to redesign and transform student learning, we should go for it. And this is where our focus should be centered on when it comes to the technology thing. That’s to say, seeking for ways to teach with tech in which our creativity and good skills of teaching accompanied with knowledge of technology allow us to transform learning experience. I agree with most things in the psot and comments above. And I also think that teachers should receive training on using different types of visual aids, both ‘traditional’ and high-tech versions. As you say, there are plenty of contexts where teachers may not have IWBs and higher-tech tools to use, and initial teacher training should also prepare people for those! Where I teach, for example (yes, in Europe! at a university! ), it’s only in the last couple of years that we’ve even had data projectors in all seminar rooms, and we still have to bring our own laptops to use them. It’s chalkboard and OHP most of the time…! !